Today, while a bunch of my friends were visiting Victorian England at the Dickens Fair (FB), I was visiting a different historical reenactment: Tumbleweed Township (FB). 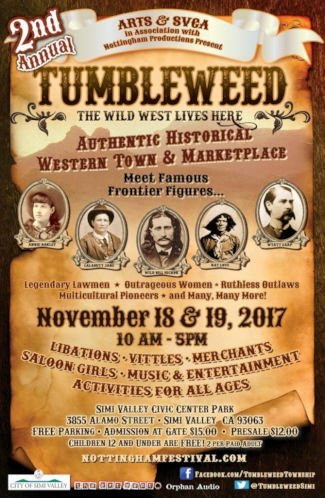 When asked to describe what Tumbleweed is, the best explanation is: Take a RenFaire and move it to Western America in the 1880s. In many ways, that was what was literally done: Tumbleweed is produced by the same team that produces the new Nottingham Festival (FB), in the same location, with many of the same vendors, the week after the two week Nottingham Festival. The first year, Tumbleweed was a bit unsure of itself. It was damp and cold, and the layout was odd. But it survived to a second year, which is a good thing. The layout this year was similar to Nottingham two weeks previous — no big surprise there. There seemed to be slightly more artisans, although a number that were there the first year (notably, the folks where I got my hat and my Yucca walking stick) were not back, and a number did not say from Nottingham (again, not a complete surprise, as some vendors wouldn’t work as well in the Old West setting). There was a reasonably good variety — some food (although more is really needed, especially for those gluten free), a number of knives and metal work, boots, costumes, jewelry, perfume, and such. There were no stave or pottery vendors. I hope the vendors did well enough to justify their return next year, and that more vendors join them. I watched a bit of a few shows. They had the same problem that Nottingham did: they needed more musical acts. There were a few, and a number of storytellers and historical reenactments. There was a shootout and a land grab, and loads of games for the kids (including horseshoes). I tend to like Tumbleweed a bit more, perhaps because the time period is a lot more accessible and accepting. By that, I mean that many of the historical attitudes towards minorities and other religions that were present in Elizabethan and even Victorian England are less present than in the Old West. There are still problematic attitudes towards Native Americans and Women, but that will exist in almost any historical reenactment because, well, you know, history. But the costuming is also more accessible — jeans, suspenders, a flannel shirt and a western hat work well, and there are much fewer anachronisms in costuming (except for the steampunks, but even they fit in a bit better because Jules Verne is about the same time). Still, I would really like Tumbleweed to succeed a bit more. They may need to embrace the time of year a bit more: we’re talking mid-to-late November, so incorporating some Winter holidays could work. Bring in “A Mulholland Christmas Carol” — not only is it roughly time and theme appropriate, it is area appropriate given the Township is in Simi Valley. Of course, you can spread the word as well, and even come on Sunday. Tickets are available at the gate or online (where they are cheaper). More information is on their website (and note that unlike that Big Festival at the Dam Site, parking is easy and free). Tomorrow, it’s Spamilton at the Kirk Douglas Theatre (FB) on Sunday. Thanksgiving Weekend will bring Something Rotten at the Ahmanson Theatre (FB). November concludes with the Anat Cohen Tentet at the Saroya (the venue formerly known as the Valley Performing Arts Center (VPAC)) (FB) and Levi (a new Sherman Brothers musical) at LA Community College Caminito Theatre (FB). Southern California has two Renaissance Faires. There is the big one — the granddaddy of all Ren Faires — in Irwindale (nee Devore nee Agoura). There there is a newer faire — Nottingham Festival (FB) — that started 5 years ago by some of the original participants, with the goal of being truer to the original ideas of the Faire than the granddaddy had become. We supported the kickstarter of Nottingham 5 years ago, and have been attending ever since. Today was opening day, and we just got back. So what did we think of this year’s Faire. First, be aware that Nottingham is much much smaller. My guess would be ⅓rd the size — which fits right for the running time, people, vendors, and such. They simply don’t have the variety of the granddaddy, but that doesn’t make them any less enjoyable. We just get through faster. The folks behind Nottingham run a second faire at the same location on the heels of Nottingham: Tumbleweed Township, Tumbleweed — this will be its second year — is the old West (US) in the late 1800s. It is a time period that is a bit more accessible to many, and one that fits well with the Simi Valley location. Many of the vendors sell at Tumbleweed as well, changing their product mix as well. We went last year to Tumbleweed and enjoyed it quite a bit. This year’s Faire was in the same site as the last three years, and the layout felt… comfortable. It was as if they had figured it out. There wasn’t too much walking. Stages were mostly accessible. It felt as if there were a few tweaks from last year, but it worked. Vendors There was a good mix of vendors, from some of our favorites, some of our friends, and some we hadn’t seen before. We liked the pottery vendor and picked up some pieces, as well as signing up for Farm Fresh delivery. There were a number of good clothing and jewelry vendors that had stuff we liked, but didn’t have a need to purchase. Prices were good. Food There were a small number of food vendors. Prices were reasonable, with ale/beer at $6. Selection was a bit of a different issue. I look for what I can eat (healthy, no grease), and what my wife can eat (gluten-free), and our options were relatively limited. So it was OK for a small Faire, but could have been a little better. Music Music was surprisingly light this year. There were some groups we liked (Merry Wives), but they weren’t there opening day. There were less wandering groups of musicians and dancers than usual. There were less musical groups at stages. Entertainment There were some groups we liked from last year, but in general we didn’t find the stage shows and they didn’t have the grab factor walking by. This could just have been the opening day mix, because I know some of the group are good. Education / They had the Masters Pavilion again — which is one of the hallmarks of this Festival, but they didn’t clearly indicate who would be there and when. Enthusiasm The folks here are super friendly. We weren’t even wearing that much garb (I was in a mix of RenFaire and Tumbleweed, as I though it would be cooler and might rain), and we got loads of compliments. Layout They’ve gotten the layout down, eliminating the problems of the first year or two. Bad Costumes We really only saw one bad costume, someone dressed as a hell-boy. Nottingham is doing a good job of growing at a slow place while not losing what makes it special. I look forward to next year and its further improvement. They seem to have the entry aspect under control: there were no lines. Whether that is due to lower attendance, I don’t know. I do know that it was a simple “collect your ticket”; there were no security inspections upon entry. Had we known, we might have brought drinks. I think this Faire is small enough that the concern isn’t all that great — there were uniformed (although not period uniform — that would be neat!) police officers wandering around. For some reason, I didn’t like this year’s arrangement as much as the last two year’s (2015, 2014) (although it is certainly better than 2013‘s). 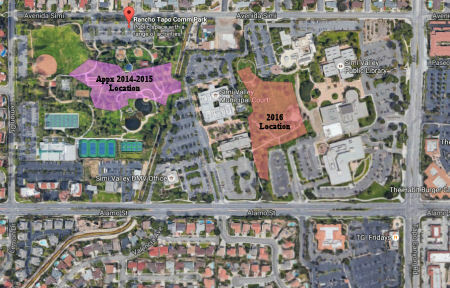 [Evidently, 2015 was in the same location, but I recall the layout being very different] The stages seemed harder to find, parking seemed tighter, the Master’s Pavilion (normally a star attraction) seemed tucked away as an afterthought behind some stores. The kids stuff seemed hidden, and there was less play space. It wasn’t a disaster, but I’m not sure the economy of the using the same space and layout as Tumbleweed helped overall (although it did save the sponsors a lot of effort). The new layout, however, did provide some picnic tables. I’m hoping this is like the situation in 2013 — they will workout the flow kinks for the combination, and next year will have a better flow. Food vendors seemed a little bit lighter than in past years. What was there was excellent and not overpriced, so who am I to complain? I certainly enjoyed what I had for lunch, and wanted to try more but didn’t have the room. There was still a dearth of beverage options for those avoiding sweet beverages — I still maintain that having a “water fill” station for a reasonable price ($1-$2) would allow people to fill their mugs and goblets, and use a lot less plastic and other waste. There were also precious few gluten-free options for my wife — the turkey legs and the Topanga Jerky were about it. Entertainment options were good from what we saw; as always, more music is welcome. The program was lacking — the map was really rough, and there was not a list of all vendors (which would be very useful). The crowd seemed reasonable for a small festival — I hope it was worthwhile for the vendors. There was a really good selection of vendors — I believe a few more than last year. They have added at least one pottery vendor, and there are a few more clothing vendors. They still, however, are missing a stave / wand vendor (which is a big surprise, as they had a stave vendor at Tumbleweed). Here’s hoping for more continued growth. There’s a new Faire in Simi Valley, and we went to it today. Although, to be truthful, it isn’t really a Faire. However, it is Faire-like, and it is true to the spirit of Faire, and for something new, it is quite remarkable. It also raises some interesting questions. 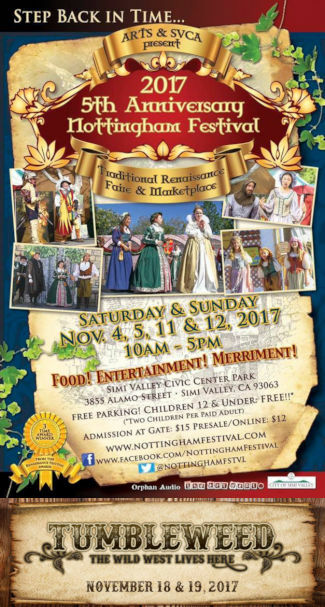 Since the days after the Faire put on by the Living History Center left Agoura, there has been a desire to bring a more accessible regional Renaissance style event back to the Ventura County area. A group of dedicated volunteers from the community along with the Actor’s Repertory Theater of Simi and the non-profit Simi Valley Cultural Association set out to make that dream a reality. Nottingham Festival will recreate the magic and revelry of an Elizabethan faire and marketplace with street performers and stage acts that will provide entertainment for all ages. Craft workers and reenactors from various guilds will entreat you to experience a taste of the handicrafts and lifestyle of the 16th Century. Our hope is that you will be well entertained and maybe even learn a thing or two about the time period and its people. Proceeds from this non-profit festival will be granted to smaller non-profit agencies in the surrounding communities, as well as some set aside for the further development of the arts programs for youth. Now that you know what the notion behind what Tumbleweed is, how was it executed? Pretty good. It was very small this year. There were perhaps 8 food vendors: turkey legs, BBQ chicken and steak and veggies, kettle corn, sandwiches, shave ice, ice cream, coffee, and of course, mead, whisky, and cider. There were about 15-20 vendors: a few clothing, jewelry, soaps, crafts, and such. There were three stages with a small number of shows. There were a few guild-like exhibits, including a quilting bee. There were games of chance. There was also the “Grand Exhibition Hall of Famous Personages” — which is like the “Explorers Hall” at Nottingham with famous people brought back to life, from Jenny Lind to Annie Oakley to Kit Carson, to Sacagawea to… you get the idea. So, the town was small and attendence was moderate — but the idea is great. A big problem with Faire is that there are so many of them, and they are all similar, and all explore the same history. This was a new historical area, and actually relevant to when it took place. Simi Valley and California epitomize the west, and towns like this did exist. With better publicity, they could be starting a new trend (further, I could image this being something that Orange Empire Rwy Museum could do quite well). But there are dangers as well. What RenFaire has become is fantasy; it rarely presents true living history anymore. This is good, because it is accepting of all races and creeds (whereas the original Elizabethan time would be less forgiving). If there is any parodying of culture, it is parodying of Anglo-Saxon culture. When we turn to the old West, however, we run the risk of stereotypical “Cowboys and Indians”, of the Lone Ranger and Tonto, and this can be a danger. While there was freedom in the West, it also created a stereotypical view of the Native American — and care must be taken. However, done right, it can present a true picture of the relationship between Western settlers and their Native American neighbors — different from what the movies might present. It also created the question in my mind of what other periods of living history might be ripe for equivalent events — and how might this be done without cultural approbation. Other eras have been done — just look at the successful Great Dickens Christman Fair and Victorian Holiday Party (FB) in the Bay Area. Doing a Feudal Japan Faire would probably not be a good idea. But what about Europe in the Dark Ages, well before Elizabeth. What about the mid-East in Biblical times? What about a Colonial faire? All could be quite interesting — and educational. Coming back to Tumbleweed Township (FB): Was it a success? I can’t speak to financially for the participants, but I think it is a great idea, and we’ll certainly be back. I hope it grows, for it is an era that is worth exploring. 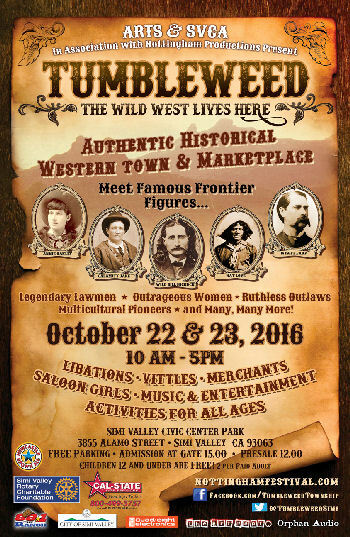 Tumbleweed Township (FB) runs for one more day, running 10 AM to 5 PM. Tickets are available online or at the gate. The event takes place at 3855 Alamo in Simi Valley across from the DMV! This weekend, instead of going to the theatre, we went to a form of living theatre: the Nottingham Festival (FB). Nottingham is a new “old-style” Ren Faire, now in its third year. The main people behind Nottingham (other than the Kickstarter supporters, a group of which we are a member) are Jan Glasband (FB) and the good folks at Actors Rep Theatre of Simi (Simi ARTS) (FB); these are the same folks behind the excellent production of Addams Family that we saw last week. As charter supporters, we’ve been every year; this year was in a slightly larger space, and the faire has expanded to two weekends. Those familiar with the history of RenFaire know how Faire started: In Southern California, in the hills of Agoura between Los Angeles and Ventura County. It was run by the non-profit Living History Center, and had a traditional feel. Over the years it moved and grew, going first to Paramount Ranch, then Devore, then the current location as San Gabriel Dam. “Southern”, as the Faire was styled, was run by a for-profit organization. Held in April and May, it is often hot and dry, vastly overcrowded, and at times has a very commercial feel. It is still fun to go to, but for those who attended Faire in its earliest days — it’s not the same thing. I was at Faire in Agoura a few times, going with folks from the UCLA Computer Club. My vague recollections are of a much simpler country faire, not the continual walking back and forth and the hoards of people that Faire entails these days. I’m pleased to say that Nottingham has recaptured that old Faire feeling. I was noticing it today: a much more relaxed feeling, a lot more history, and a lot fewer outrageous costumes. My wife and I were even complemented on our garb, accumulated over the years. That has never happened before. It is friendlier. I noticed that we felt freer to sit and watch some shows: we saw some speeches by Niccolo Machiavelli (portrayed by Frank Dantona) and William Shakespeare (portrayed by Dan Will McCann (FB)*) at the Master’s Pavillion, the Merry Wives of Windsor at the John Barleycorn Stage, and Shakespeare doing a workshop of Hamlet on the Gloriana stage. It’s not just me who feels this way. I was talking to a friend of mine from computer club days, who has been involved with Faire since Agoura. He commented on how this Faire was different than “Southern”: audiences tended to be appreciative and stay for entire shows. Additionally, Faire Management actually appreciated the performers and were grateful they were there (where as at “Southern” they were treated as employees, potentially out to abuse the system). That’s not to say Nottingham is perfect yet. This year the main problem was liquid based: although there was wonderful ales, meads, and ports, and bottled water (at $4 per, with no refilling stations), and a few bottled sodas, that was it. There was no coffee, no tea, and no options other than water for those avoiding alcohol and HFCS/artificial sugar. I’m a big proponent of providing refilling stations, and given that numerous mugs and goblets are available, having a “fill your container for $2” would keep people hydrated, reduce plastic waste, and actually waste less water. Similarly, having coffee, tea, and iced tea (and perhaps chai) could be put into people’s containers and not push excessive sugar and booze. Some picnic tables would also be nice, and a slightly wider variety of food vendors would be great. Those are all things that can be fixed next year, or perhaps even next weekend. I heartily recommend Nottingham Festival to anyone who loves Ren Faire as it used to be, back in the early days. 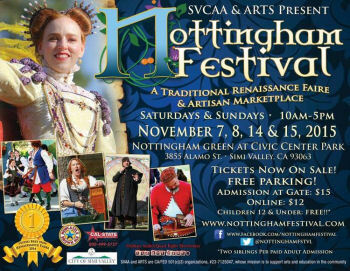 You can still go to “Southern” when it comes around in April, but Nottingham is becoming a wonderful pre-Thanksgiving traditional in LA/Ventura Counties. I look forward to further improvement in 2016. Huzzah! Verizon Contract Plans. You may have heard that Verizon was getting rid of subsidized phone plans. That’s actually not true — it is only true for new customers. Old customers — as long as you keep renewing or have phones on the old plan — you can keep it. iPod Classics. Well, they aren’t going away. You can even do as I’m thinking of doing and put in a SSD. But, alas, Apple is declaring them obsolete as of Labor Day. I’m sure you can still get them repaired, although some parts may be harder to get.